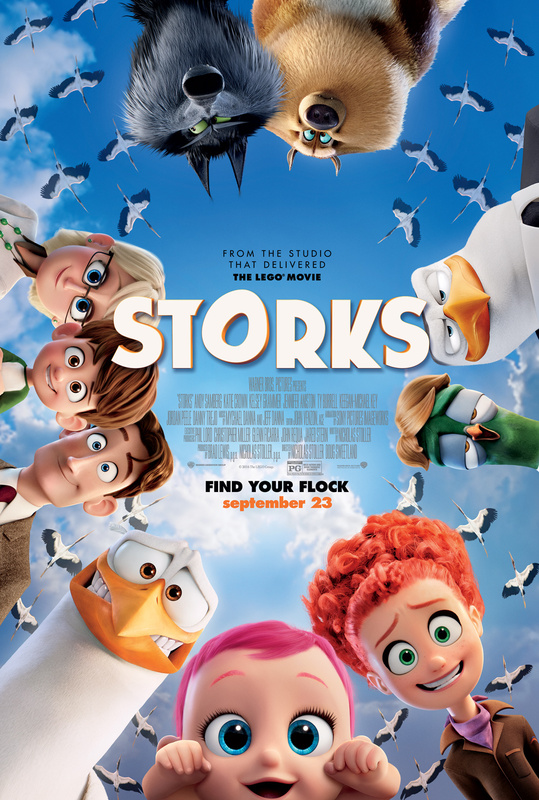 Storks have gotten out of the business of delivering babies in favor of an Amazon-type model, and Junior (Andy Samberg) is the star delivery stork. Boss stork Hunter (Kelsey Grammer) is being promoted and would like Junior to take his place. But first, Junior must “liberate” the accidental troublemaker and newly-18-year-old Tulip (Katie Crown), a girl whose delivery instructions were lost and has remained with the storks. Junior instead assigns her to the now-dormant mail room, expecting her to not be able to break anything, until she receives a letter from Nate (Anton Starkman), a bored single child to workaholic parents who wants a little brother. Tulip sends the letter to the wrong machine, and a baby – somehow – is born. Junior, knowing that he’ll lose the promotion if Hunter discovers what has happened, teams up with Tulip to deliver the baby. It hasn’t been a particularly memorable year at the movies, especially for those in search of a good comedy, so it’s a relief to see a film like “We’re the Millers” arrive in theaters, because although it’s not as funny as its behind-the-scenes talent might suggest, it’s one of the better comedies released thus far. Directed by Rawson Marshall Thurber (“Dodgeball: A True Underdog Story”) and co-written by the guys behind “Wedding Crashers” and “Hot Tub Time Machine,” “We’re the Millers” doesn’t break any new comedic ground, but it’s packed with some great laughs and an ensemble cast that seems game for just about anything, no matter how outrageous or inappropriate it may be. “SNL” veteran Jason Sudeikis stars as David Clark, a low-level drug dealer who gets robbed one night by a group of thugs, losing his entire stash and personal savings in the process. His slimeball boss (Ed Helms) doesn’t take the news well, but he offers David a chance to make amends by smuggling a “smidge” of marijuana across the Mexican border in exchange for a clean slate and $100,000. David knows that a single guy traveling alone in an RV will only draw attention from the border police, so he recruits a fake family to serve as a disguise, including the stripper who lives in his apartment building (Jennifer Aniston), the dorky virgin next door (Will Poulter) and a bratty teen runaway (Emma Roberts). But when they arrive in Mexico, the aforementioned “smidge” turns out to be a few metric tons, and worse yet, it belongs to someone else, forcing the ersatz Miller family on the run from a ruthless drug lord. Most movie stars like to take breaks between big films, but they don’t necessarily want to stop making money. Check out these five ways movie stars make money between films. Creative types often use their off time pursuing other crafts, such as visual art or music. Keanu Reeves played bass in a band called Dogstar until the Matrix Trilogy hurtled him into a new level of celebrity. Donald Glover, who acts in movies as well as the television series Community, spends quite a bit of time pursuing his career as a rapper under the pseudonym Childish Gambino. By all accounts, Glover is considerably better at his musical craft than Reeves. Few actors have successful careers as inventors. 1930’s film star Hedy Lamarr, however, had a flair for mathematics that made her an outstanding inventor as well as an actress. In fact, Lamarr co-created a technology that made it nearly impossible for enemy armies to jam radio communications from US soldiers. The military didn’t fully understand the importance of her invention, but her frequency-hopping, spread-spectrum patent played an instrumental role in developing Wi-Fi networks and Bluetooth. Jenna Fischer, who has performed in hit comedies such as Blades of Glory and Hall Pass, made some extra cash by endorsing Proactiv products in 2010. While endorsing products like Proactiv’s dark spot corrector, she also won a Screen Actors Guild Award for her performance on The Office. That must have been a busy year! A lot of actors don’t want to appear in commercials because they worry the work might tarnish their reputations. When they’re away from home, though, many of them will appear in commercials for extra cash. Jennifer Aniston appeared in a German Heineken commercial. Leonardo DiCaprio starred in a TV ad for an Italian telephone company. One of the weirdest examples, though, comes from Nicholas Cage, who played himself in a commercial for a Japanese gaming device. In the ad, he becomes crazed by blonde triplets, jumps on top of his car while yelling “fever!”, and speeds off without warning. Movie stars have a lot of money, so they are key targets for any entrepreneur who needs startup capital. Planet Hollywood is probably the most popular example of this. Without investments and endorsements from Bruce Willis, Demi Moore, Sylvester Stallone, and Arnold Schwarzenegger, it’s unlikely that this chain would have become as popular. Ashton Kutcher has invested his money in companies that seem much hipper by today’s standards. Some of his investments include Foursquare and Spotify. He also bought into Skype before it became popular. Even if he hadn’t gotten rich off his romantic comedies, that well-timed investment would have made him extremely wealthy. Actors have to do more than just sit around looking attractive when they’re between films. What other celebrities have you seen participating in side projects?